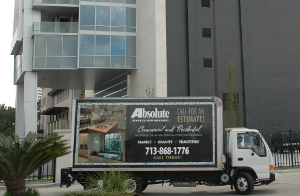 Absolute Marble and Granite is a fully insured fabricating installer of stone countertops to the national market. Helping make kitchens, baths, fireplaces and summer kitchens look beautiful for over ten years, we look forward to being the fabricator of your choice for your next project. A WORLD of STONE products. Over the years, Absolute Marble and Granite, ( AMG ) has fabricated every brand of stone, including Quartz surfacing, which is available worldwide. Whether it is a commercial or residential application, AMG strives to give you the best finished product you can find for your project. A GALAXY of GRANITE. Upscale, beautiful and timeless, your imagination is the only limit when colorizing for your home. Selecting stone from any of the local granite distributors in the Houston metropolitan area, your dream can become a reality. AMG is also an installer of stone and tile products to the national market as well. Helping make homes, patios, walls, pool decks, and showers look beautiful as well, we also look forward to being the installer of your choice for your next project or upgrade to your commercial or residential projects. Having served people for over ten years now, AMG strives on customer satisfaction. It is not until the customer is happy and satisfied that AMG leaves a job. No job is too big or too small.